You do not have to spend a lot of money in Las Vegas to have a good meal. The next few pages have great ideas for cheap food on and off the Las Vegas strip. Don't be fooled by the fancy restaurants and expensive cocktail menus, cheap food is easy to find in Las Vegas. A few of my favorites range from the chicken sandwich at Shake Shack at The Park Las Vegas, Five50 Pizza Bar at Aria Las Vegas and the Hainan Chicken at Flock and Fowl. Check out Fulton Street Food Hall at Harrah's for an alternative to the typical Las Vegas food Court and stop into the Beer Park at Paris Las Vegas for an alternative to the typical Las Vegas nightlife. Need more ideas? Read on... or visit 77 Places to Eat Cheap in Las Vegas and The Best Affordable Restaurants in Las Vegas. Also, a directory of Cheap Eats in Las Vegas should help. The only thing on this list that is not $20 because they have decided to make it $20.16 The best deal in Las Vegas, lunch at Estiatorio Milos at Cosmopolitan Hotel will make you want to come back for dinner. Sorry, at dinner the regular menu is available and it is a little more than $20. If you find yourself at Cosmopolitan Hotel your options for affordable are pretty good with Holstein's, D.O.C.G.and Secret Pizza. A couple of tacos and a beer at China Poblano might fit you under the $20 cheap food ceiling. Every one of these restaurants has hidden gems on the menu, just remember that alcoholic drinks are the killer of the cheap meal. Have free water and your bill stays low. Go downstairs and put a few bucks into a slot machine right as the waitress walks by and you can get a free drink instead. A pizza and Prosecco at D.O.C.G. and you and a date can eat for under $20 each. If you choose not to share your pizza( I usually don't) there are enough options that you will walk out feeling like you just robbed the place. This is a steal in Las Vegas and the idea that they are cranking that wood-burning oven into the 800-degree range just to get you an awesome pizza is all the reason in the world for you to stop by. You should probably get some of those stuffed olives, too. If you look over the menu you will find some affordable items but be warned that the price tag can easily skyrocket if you don't keep your eye on the prices. Noodles and beer in a spot that feels very un-Vegas but just steps away from the Downtown Las Vegas casinos. Have an early meal and you will not wait as long. You can also sit at the bar and get in faster. This is a glorified street taco so go in expecting the basics. You will also pay next to nothing and leave there stuffed. 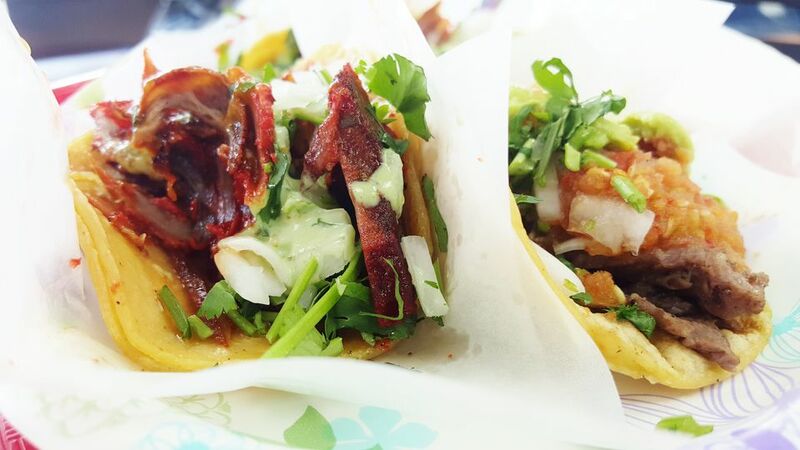 Tacos El Gordo is located just a few minutes by foot from Wynn Las Vegas, so get to that side of the strip and indulge. A slice and a beer and they are open late at night. What else do you need? Well, once you find the tiny spot in the Cosmopolitan Hotel take your secret pizza out to the common area and do a little people watching. Get one Margarita, a grilled corn on the cob and some bone marrow in a soft fluffy tortilla, and you'll have change to drop in a slot machine when you are done. Hussong's Cantina is good for cheap people like ourselves because we can fill up on chips and salsa while we have a few beers. Of the gourmet burgers on the Las Vegas strip, Burger Bar has the cheapest at $9.95. If you add in one of their many craft beers you will have an exceptional experience for less than $20. This is a great deal but you need to be careful with their beer selection because it will entice you to spend more money. I am barely a breakfast guy unless it is off the charts, JJ's Boulangerie gives me an option in the morning. I can go small with some freshly baked bread or crank it up with a full-on meal all for very little cash. D. Vino provides wine and pasta for a low price as well as lunch specials and a decent happy hour. Earl of Sandwich will give you a no-frills sandwich for under ten dollars. They heat up the sandwich and you can have it right there or walk around the casino gloating about how you got the lowest priced meal in Las Vegas. Cheap but good food is what Serendipity 3 is all about. However, you will have to share the dishes here if you plan on getting a good deal. The huge portions are made for two or even 3 in some cases. Also, sit out on the patio if possible and take in all of Las Vegas. Chef Claude at Top of the World will knock your socks off with his approach to food. There is no attempt to fool you, he just does a solid job of delivering a very good product. You might notice the view of the Las Vegas strip from your table but the food might just distract you. This spot is relatively cheap for lunch. When you factor in the scenery its a bargain. You will have to watch what you order if you want to keep the price respectable. Finding a place that is cheap at Wynn Las Vegas is a bit of a struggle because it is a luxury resort. However, step into La Cave and you'll be surprised to find quite a few things on the menu that will satisfy you and not hurt your vacation budget. Beer and some flatbread and you easily stay under the $20 threshold. Breakfast can be cheap here and a light lunch is also a bargain, but unfortunately, dinner gets a little harder to come in under $20. Chowder and a beer, a few oysters and some bread and you are rocking the change from your $20. The bar is a great place to meet new friends as well as have some decent food for a low cost. The Oyster Bar is at Palace Station and not on the Las Vegas strip so you will have to hop in a cab to get there. This is no ordinary buffet. The M Resort puts out a spread that includes Kalua Pork that is almost as good as Da Kitchen in Kahalui, fried chicken that might come from your favorite southern cooking spot and a Seafood Cioppino that tastes like what you've had at Fisherman's Wharf in San Francisco. Beer and wine are included in the cost of your meal. If you don't want a buffet head into the Hash House A Go Go and split a dish. Everything is huge and you can leave there stuffed with money in your wallet. Huge portions and some killer chicken. What else do you need to know? Split these huge portions at Hash House A Go Go with a few friends.